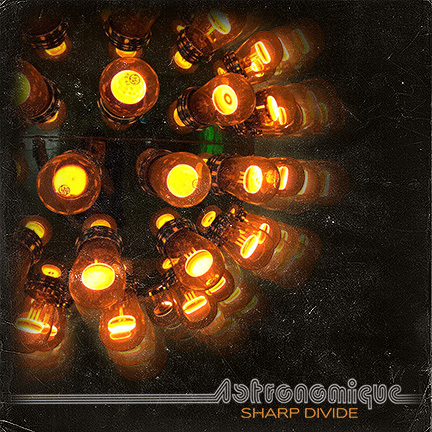 "Sharp Divide", is just around the corner of release time for dark wave/synthpop act Astronomique. This album of course, consisting of a single, the first for this release called "Losing Our Control". This single not just being released as a single but having an accompanying video to follow suit as well. Both track and video play off fairly nicely, as one is visual while the other is audio, you get the idea of what to expect. That being that for an act such as Astronomique their style is very much like a lot of the other acts in existence for some time now. Think of such acts like The Crüxshadows, The Cure, London After Midnight or even Diary of Dreams. Upon listening to "Losing Our Control", is did bring to mind these sort of other acts. Those styling's being a lot like what Astronomique is doing with their own take of the similarity of genres used. The entirety of the track is very soft driven, being in-depth yet dense. The material catching for the ear, as the instrumentals do most of the work, really cycling you the listener into it. Whereas the vocal chords, play their share of material, as they show aggression yet talent of rawness. In other words, the material sounds decent, yet bouncy and swaying. It's a type of dark wave synth pop style, that you can easily dance to as well as find yourself humming to as well. The band is very compelling, and can be even addictive in tone, as their music tends to put you at ease but in a trance sort to speak. Astronomique is an act of its kind and time, because of how they create their melodies and tone of music, it can just grip you, not releasing until it is good and ready to do so. Their material just taking you on, because it can do what it can, to enchant you as it will. It is how Astronomique works their craft and talents that is music.